THERE’S AN UNFLAPPABLE new crime fighter on the scene and she goes by the name of Wunsy. This pet parrot is helping out her pals in the Old Bill by ruffling feather and striking fear into the hearts of North London criminals. Wunsy and her owner Rachel Marino were enjoying their daily stroll in the park on Friday, when the pair were set on by an unidentified assailant. They were en route to a field where Wunsy could fly on the lead and harness when Marino was pushed to the ground by the attacker and the bird quickly swooped to her defence. “It all happened so fast” the 25-year-old told ITV London. She started flapping around and then he just sprinted off. It’s very possible that she slapped him in the face [with her wings] but I can’t see behind me so I’ll never know. London’s Metropolitan Police said Marino was very lucky not to have been hurt, and are now appealing to the public for any information. “Although the parrot Wunsy came to her rescue, we are obviously very keen to trace the suspect and prevent him from attacking anybody else”, Pc Chris Cutmore from Colindale Police Station said in a statement released on Facebook. Meanwhile, Wunsy (who contrary to the Met Police’s reports is actually female) is already back in her harness and ready to fly another day. Email “Fearless pet parrot saves owner from attacker during daily walk in park”. 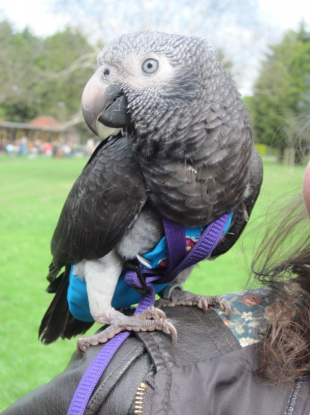 Feedback on “Fearless pet parrot saves owner from attacker during daily walk in park”.